The cold winter months can have harsh consequences on your plumbing system, particularly on your pipes. If you are experiencing extreme temperatures, your pipes have a higher chance to freeze than usual. Frozen pipes can eventually burst. A burst pipe can be incredibly damaging and costly. If you are dealing with a burst pipe, the first thing you must do is turn off your water. 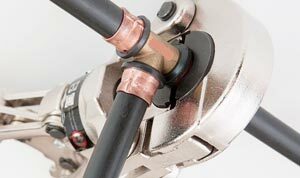 Every homeowner should know the location of his or her main water valve. When the pipe bursts, immediately go to the main water valve and shut it off. You want to ensure that your home is safe. If the location of the burst pipe is inside the home, you should also turn off the electricity. Once the electricity and water have been turned off, you should call in a professional plumber. A professional plumber in NYC will be needed to fix the damages and repair your broken pipe. Not only will a professional plumber fix the pipe that already burst, but they will also be able to prevent future pipes from bursting. After the leak has been stopped and the pipe has been repaired, you will need to remove the wet and damaged items in the home. A wet-dry vacuum or sump pump is a good device to use when removing any standing water. You will want to remove as much excess water as you can to avoid mold or mildew from forming. Dehumidifiers and fans can help to speed up the drying process.